Imagine having a whole cabinet full of stainless steel coffee mugs – you’d never have a cracked mug again! There are actually lots of different reason for buying a set of steel mugs but my favorite reason is that they’re pretty cool things to own. Here on Top Off My Coffee we feature a bunch of stainless steel mugs. 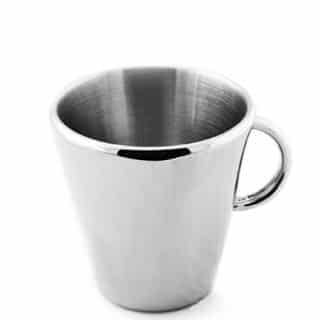 Click here to see our featured stainless steel cups and mugs from this category. Sidenote – Click to see safety of stainless steel coffee mugs. Are Stainless Steel Coffee Cups Worth the Money? Sure you could drink your coffee like a normal person out of a ceramic, stoneware, or porcelain mug or you could go all modern and use one of the better insulated travel mugs made today. 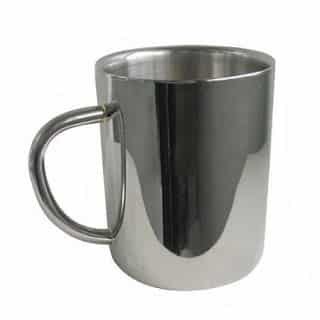 I however think a solid steel mug with handle is the way to go for the home or office. 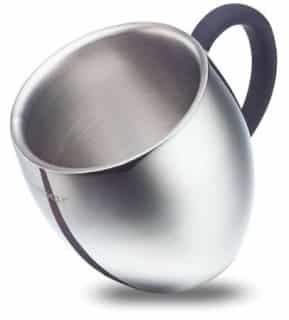 Actually, almost every stainless steel coffee mug made comes with a handle. This is because pure metal will conduct heat and you would burn your fingers when drinking hot coffee out of them. 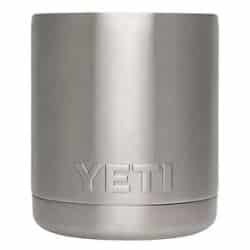 What really sets a steel coffee cup apart is their sturdy and long lasting build quality and the inclusion of a lid or and double-walled to prevent burnt fingers. I for one find these types of coffee cups to be a bit of a novelty but I can’t deny how cool many of them look. I also like that many of them look like antiques or designed after antique styles. Here are my favorite stainless steel coffee mugs with handles. Did it ever cross your mind that coffee mugs made from stainless steel might not be safe? It’s easy to envision an scenario where you pick up a steel mug full to the brim with scalding hot coffee and you immediately burn your fingers holding the mug and then drop it to the ground in reaction. In actuality this is usually not the case. 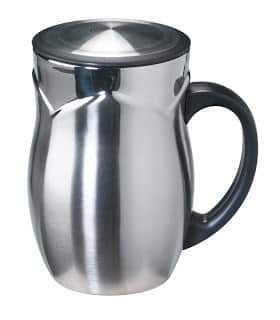 Lots of stainless mugs are made from either double wall construction or have an attached handle. Even ceramic mugs are hot to the touch and that’s why everyone uses the connected handle when drinking their coffee. Steel makes it much easier to get a double wall too which means even the outside walls of the mug tend to be cool to the touch. As for the steel itself – steel drink-ware is among the safest materials you can use. It is durable and can’t leech poisons into your body like some other materials can. With the exception of durability steel is right up there with glass in terms of safety. It’s why this material is used in many food grade products. For instance when brewing espresso coffee stainless steel is used in almost all steps right down to the cup it is served in. 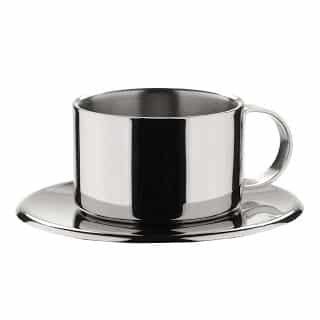 Although ceramic cups dominate the espresso cup market small stainless steel cups are easy to find as alternatives. 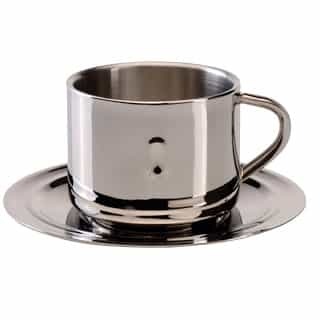 Here are some of my favorite steel cups for espresso or for general use in the kitchen. And now I have one last point I want to touch on. In many cases you’ll find that stainless steel mugs can be placed directly into the dishwasher but as is always the case handwashing is always going to be best. Mild soap and water does the trick on average days but for a really good polish using Bar Keepers Friend combined with a soft sponge scrub pad works great. It’s good to run in straight lines to because over time swirl marks can sometimes find their way onto the surface. If you are itching for more then please take a look at the following articles!